This is the actual guide I made and have open whenever I'm drawing the Taurcanis Draco (or whatever one wishes to call it). The "mh" notes stand for "Monster Heads". 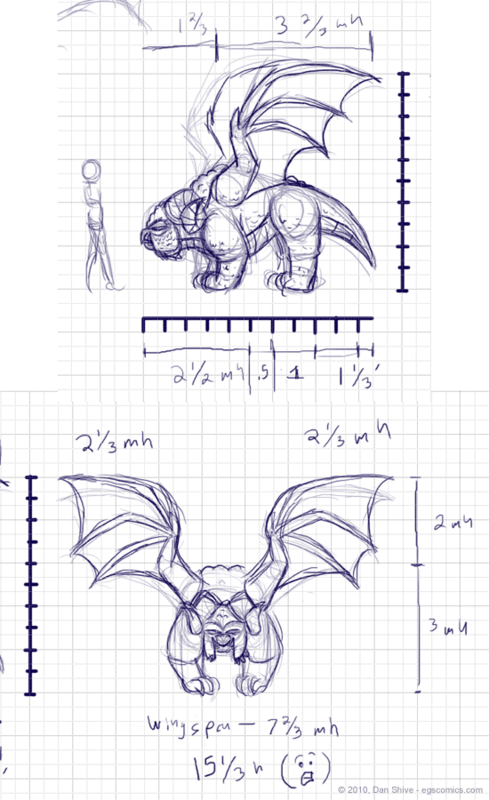 When designing the dragon, I basically decided the height of its head was equal to two average human heads. As such, "mh" = the height of two human heads, or the height of one "monster" head. Most of my human characters have approximately the same head height, which isn't terribly realistic, but neither are their proportions. Certain extremes in size will wind up with relatively bigger or smaller heads, but that usually only happens at the point where it's noticeable enough to look weird. For example, Greg's head is a little bigger than the average character. When little Rhoda was (somewhat) recently in the comic, I thought her head seemed a little bigger than it should be, so it will likely get a slight reduction in future comics. It's something I've struggled a bit with, to be honest. I like the idea of varying the head sizes, but for most characters, it doesn't look right to me. It only starts to look right in my mind when going to those extremes in size difference that I mentioned. Anyway, I'd go on more about the Dragon's specific design, but I've already rambled quite a bit about it in the story comic commentaries. It's basically what you'd get if you combined a bulldog, a bat, and a goat while making it huge and reptilian. That's pretty much all you have to do to make a dragon, really. Take one or more animals, merge them with a bat, make them scaly, and you're done!